Thank you, everyone, for your comments. 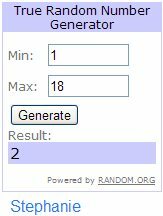 Random.org chose our winner this week. Congrats to Stephanie! I’ll send out an email to let her know how to collect her prize. You can check out the new Collection at Scrap Orchard. This is sooo adorable! thanks so much for the chance! Love it! Thanks for chance to win!!!! So cute! Thanks for chance to win! Always ready for some cuteness! This surely fits the bill. Thanks for a chance to win! That’s real cute! Thank you so much for this chance to win this kit. Another cutie! Thanks for the chance to win. Looks like a perfect Easter kit! Thanks for the chance. Cute kit. Lovely colors. Love to win. I just love this time of the year and such a cute bunny! Thanks for the chance to win! This is super cute! Thanks for the chance to win it! This is just so cute! !…thanks for the chance to win. Adorable!! Loving the colors…so bright & cheery. Can’t wait to see the whole thing!! Un cadeau des cloches pour les grands !!! Nous redécouvrons la joie de Pâques !MERCI !!! !